For most people they hear the word “El Nino” and know that it means big shifts in the weather pattern for Colorado (whether from being here long enough or hearing it from the local TV Weather people> But many don’t know exactly what “it” means exactly or the mechanisms behind it. 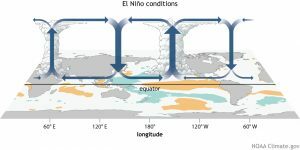 The El Nino Southern Oscillation is a periodic weakening or reversal of trade winds stretching across the Pacific Ocean from South America to Australia. This allows a redistribution of warm and cold water which in turn affects the atmosphere above the ocean as well. This means big changes in weather patterns for the tropics and subtropics along with areas further North and South. To measure the El Nino Southern Oscillation sea surface temperatures are monitored in different “Nino” regions. To make a long story short, this area stretches roughly between Australia and South American along the equator; roughly between 120E and 80W lines of longitude and between 0-5 degrees North and South latitude. There are 3 different “phases” of the El Nino Southern Oscillation that occur based on what the observed sea surface temperatures are for a period of 3 months and I’m sure you’ve often heard about them. A neutral phase of ENSO means warm water and air is pushed across the ocean towards Australia. Cooler water “upwells” from deep beneath the ocean along the South American coast. 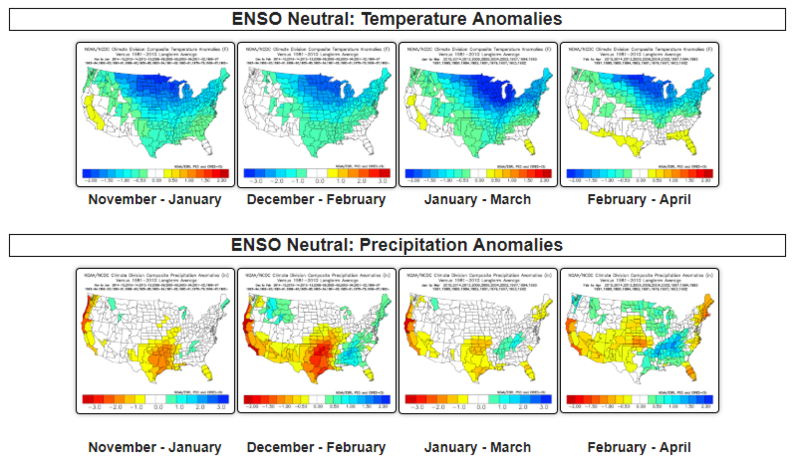 The neutral state is the normal phase of ENSO, it is neither an El Nino or a La nina. In this pattern wind blows from East to West along the Equator pushing warm moist air and warm ocean water across the ocean towards Australia. As the warmer water at the upper layers of the ocean is pushed away from the coast of South America, cooler water from deeper in the ocean rises to take its place. This is a process called upwelling and is very important to many forms of oceanic life along the coast of South America. During the neutral phase of ENSO, warmer water tends to flow towards Australia while cooler water upwells of the coast of South America. 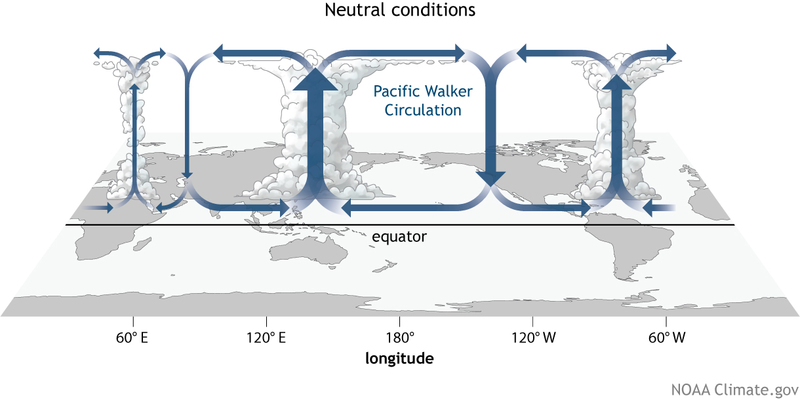 The trade winds that blow across the ocean circle back North and circle around towards North America. This West to East wind over N. America is what influences our storm track across the United States. So as you can imagine, when these trade winds and circulations get disrupted it has big implications for our weather. So what does that mean for temperature and precipitation patterns for the U.S. during a neutral phase? Basically we’d expect to follow along climate normals through the season. We should see normal temperatures, normal snowfall and normal precipitation through a period of neutral conditions. We know however; this is not always the case as there are other things that can influence our weather. During neutral conditions the U.S. tends to see colder winters across the Northern and Central United States with drier conditions to the South and close to normal temperatures. The warm phase of ENSO means a weakening or shifting of prevailing (trade)winds that allows warm water to pool against the South American coast. 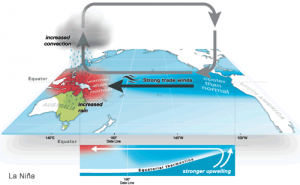 This can mean a disruption of weather patterns in the Pacific which can in turn influence the weather in the U.S. When we say an El Nino is setting up or occurring we are referring to the warm phase of ENSO. In this pattern the trade winds pushing from East to West across the equator break down or even reverse in some cases. This allows warmer water to pool against the South American coast while colder water upwells against Australia. 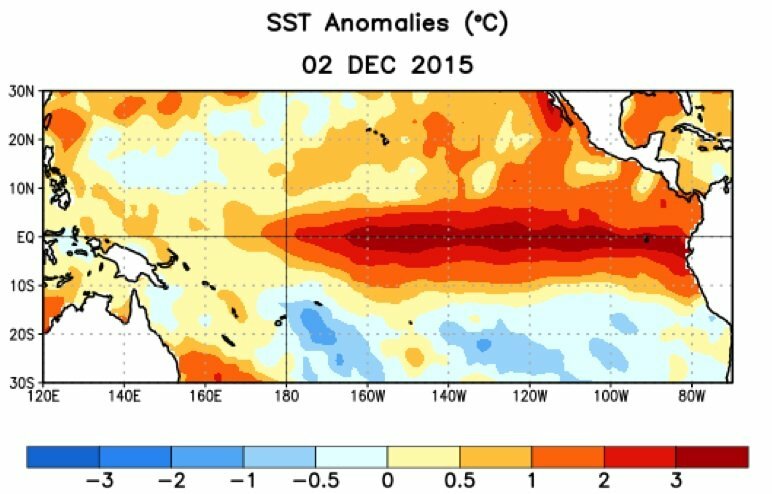 During December 2015 we were seeing one of the strongest El Nino’s recorded. Notice the extremely warm water across the Equator towards South America and the average to below average temperatures near Australia and to the North of Australia. Sea surface temperatures increase along the South American coast and sea surface temperatures drop in and around Australia. This means areas of increased convection (shower and thunderstorm activity) for South America and less for Australia. It is not uncommon for Australia to see severe drought conditions and South America to see extreme flooding conditions. 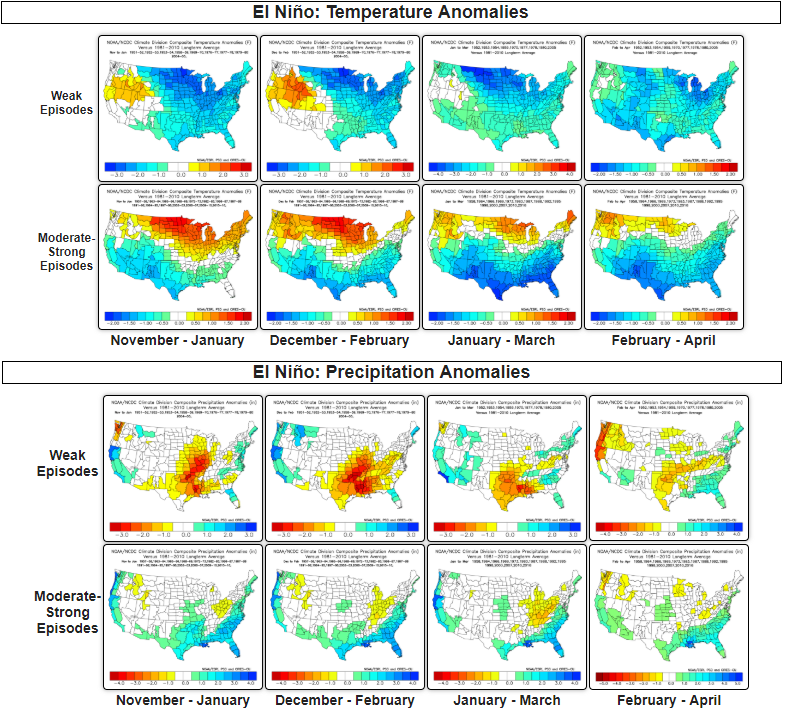 During El Nino the weather in the continental U.S. can change too. 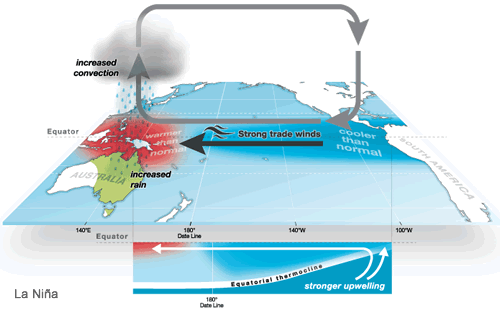 Due to trade winds and circulations being disrupted, the positioning of high and low pressure systems, along with shifts in the jet stream can cause big changes for our weather. If you’re new to Colorado, you may not know but our bigger snow storms in Denver tend to come during El Nino years, so that’s something to keep an eye on! El Nino effects on the U.S. largely depend on the strength of the event. During weaker events cooler air stays North and East while warmer conditions manifest during stronger events. Precipitation tends to favor California and southern parts of the U.S. during stronger events while dry conditions tend to show up during weaker events across the Central part of the country. 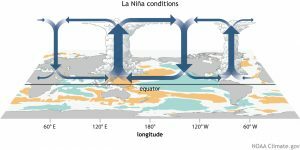 During La Nina, stronger trade winds allow cool water upwelling to spread across the South American coast. The cold water pools and will spread across the Pacific and warmer water stays further West near Australia and New Zealand. 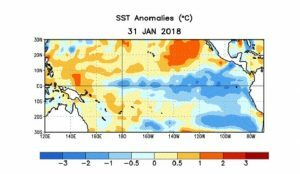 La Nina on the other hand refers to below average sea surface temperatures setting up across the South American Coast reaching further West across the Pacific Ocean. 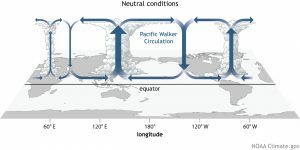 With this pattern the trade winds pushing from East to West across the equator strengthen substantially, which allows colder water from upwelling to spread out across the ocean to the West of the South American Coast. 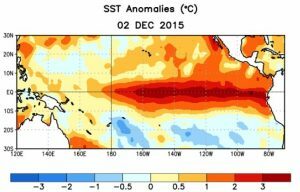 As recently as last winter we saw a La Nina event unfolding in the Pacific Ocean. 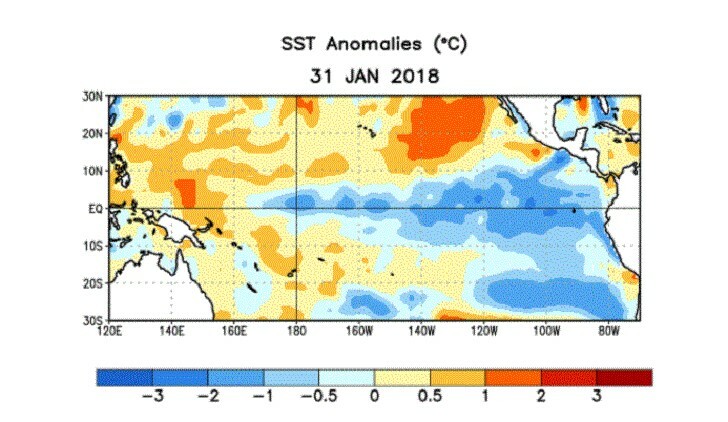 In this image of sea surface temperature anomalies from January 2018 the cooler than normal water can be spreading from the South American coast across the pacific ocean along the equator. 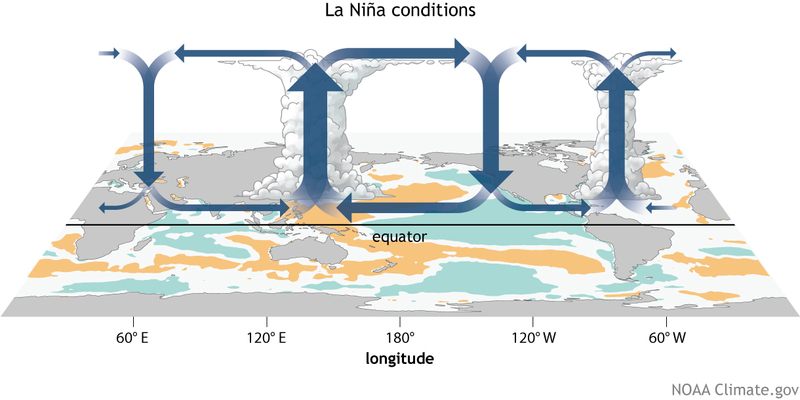 Conditions in a La Nina pattern are basically the opposite of those found within an El nino. Colder water spreads across the ocean towards the West and warmer water stays pooled up against Australia and New Zealand. Just like with an El Nino, this pattern can disrupt normal weather patterns and can mean changes for parts of the U.S.
Just like during an El Nino, ocean and atmospheric circulations get disrupted and have effects on where high and low pressure sets up and even has effect on the jet streams. During La Nina events a lot of convection gets shifted towards Asia and Austrlia, where high pressure across the Eastern Pacific and towards the United States causes shifts in our weather as well. 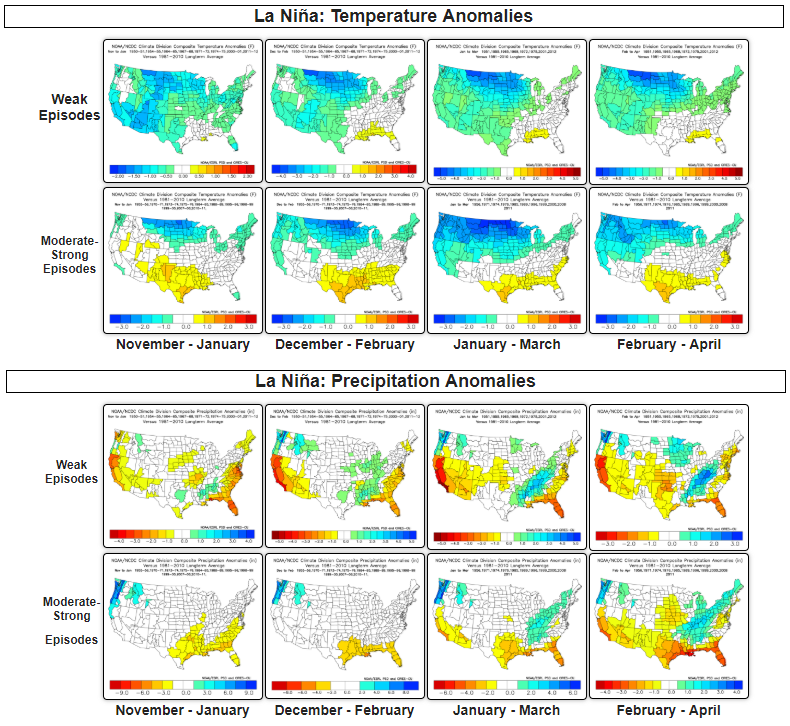 During La Nina events the overall pattern features a drier and warmer than average Southwest while the Pacific Northwest, Northern tier of the country and the Midwest tend to be a bit cooler and wetter than average. 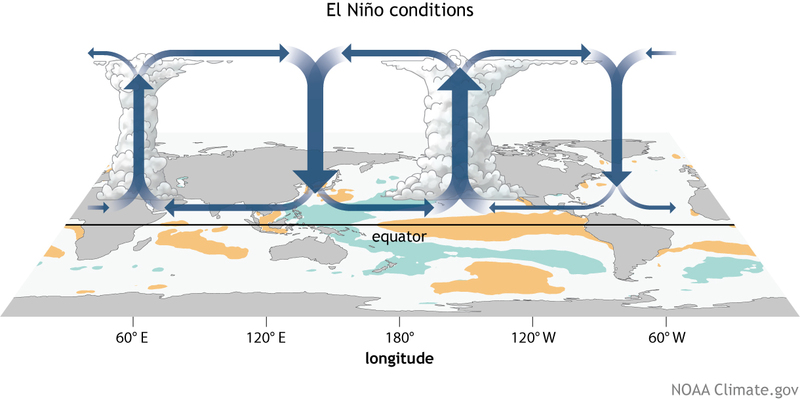 Normal oceanic pattern of the El Nino Southern Oscillation. Warmer water is found further West with cooler water from up-welling tending to stay near the South American Coast of the equator. The warm phase of the El Nino Southern Oscillation. 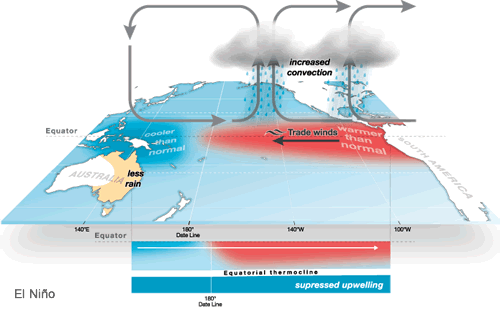 Weakening or disruption of trade-winds allows warmer than average water to spread across the Pacific Ocean. This warm water can also influence weather systems and atmospheric currents. The cold phase of the El Nino Southern Oscillation. 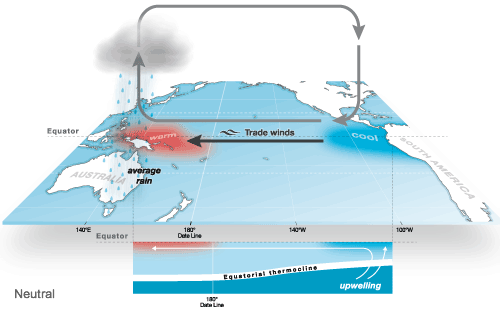 Strengthening of trade-winds allows cooler than average water to spread across the Pacific Ocean. This colder than average water can also influence weather systems and atmospheric currents. How Does ENSO Effect Colorado’s Weather? This will be coming in our next article… we will deep dive into how shifts in ENSO have effected Colorado’s weather throughout the years and how we can identify patterns to help forecast what this year’s El Nino or Neutral event may be. I’m putting together that information and will have some pretty nifty graphics and stats, so stay tuned for that in the next week or so!